Since moving to the UK (for the first time) in 2014, York has been high on the list of places I wanted to visit. I feel like I say that about a lot of places, but, York just seemed so…English. It appeared to be the perfect city break; however, as I looked into it further, I realised I definitely wanted to go beyond York as well. I wanted to explore the green countryside of Yorkshire. So when we received the opportunity to head up to Yorkshire for the weekend as guests of Visit York, we jumped on it! The best part? 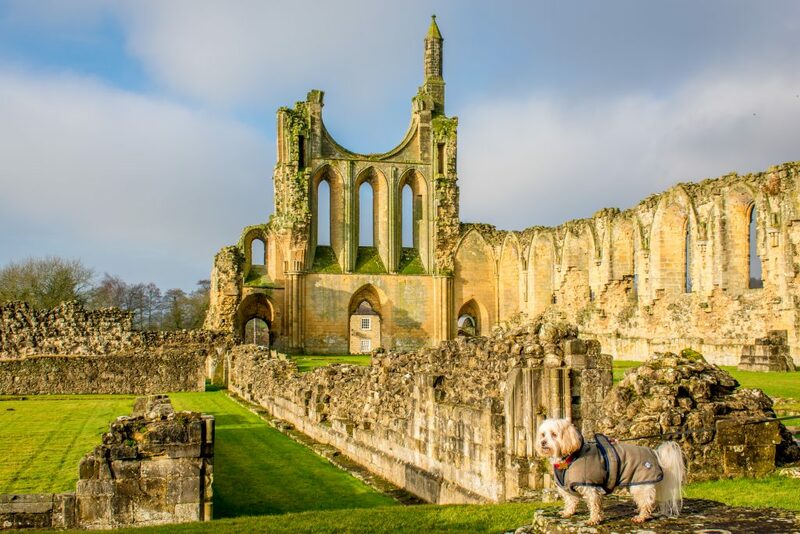 Arrangements were made in order for us to be able to experience more than just Yorkshire – we had the opportunity to experience dog-friendly Yorkshire! 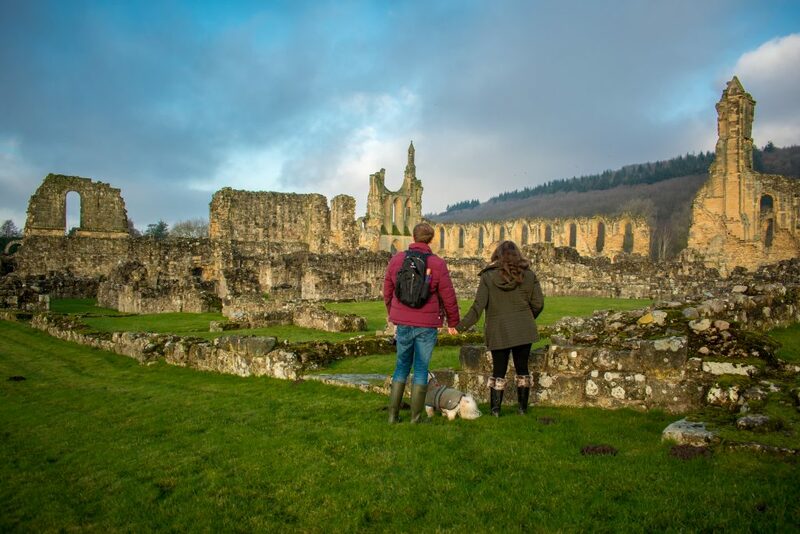 We teamed up with Visit York to spend three days in Yorkshire – one night in York centre, and two nights in nearby Helmsley, which is located in the North York Moors National Park. Our entire weekend was dog-friendly and Giorgio happily led the way as we explored. He honestly acted like he was a puppy again, but was absolutely knackered by the end! 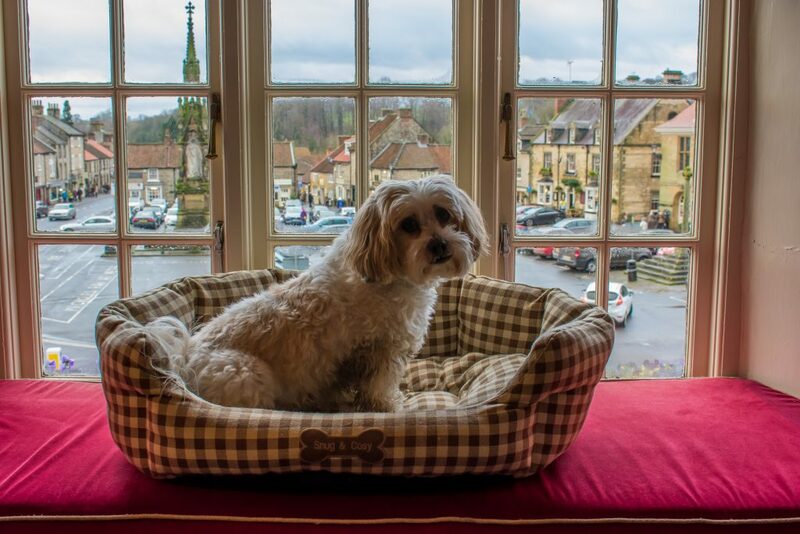 This is our guide to everything dog-friendly that we managed to squeeze into our weekend in Yorkshire. 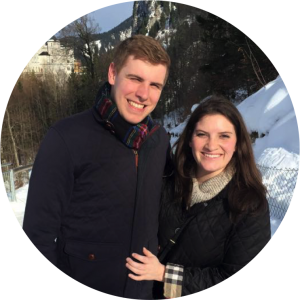 For a more detailed look into the hotels we stayed in and the activities we did, check out our guest post on Emily Luxton Travels. 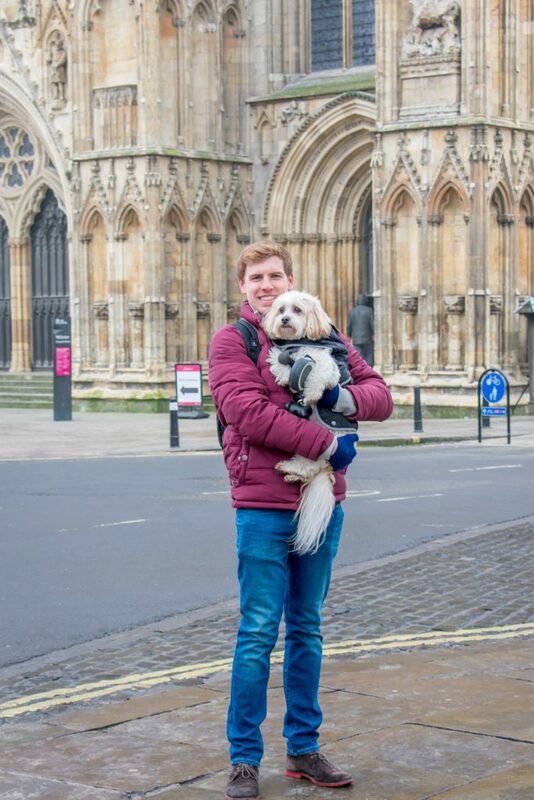 York is a beautiful city full of history, but it didn’t feel as dog-friendly as we wanted it to. In fact, we both came to the realisation that we are getting very comfortable taking Giorgio on countryside getaways, but we haven’t quite figured out how to excel at dog-friendly tourism in a city. So that could have something to do with the fact that we didn’t find York incredibly dog-friendly, but we also attribute it to the fact that we didn’t really see many dogs out and about! We managed to take Giorgio into a couple of pubs and cafes, but generally went off individually to go into the sights. Unfortunately much of what we wanted to do was closed (either for the off-season or for refurbishments) so our day mainly consisted of walking Giorgio around the city and popping into dog-friendly places to warm up. We alternated visits of York Minster, then each picked something to do on our own while the other sat with Giorgio. 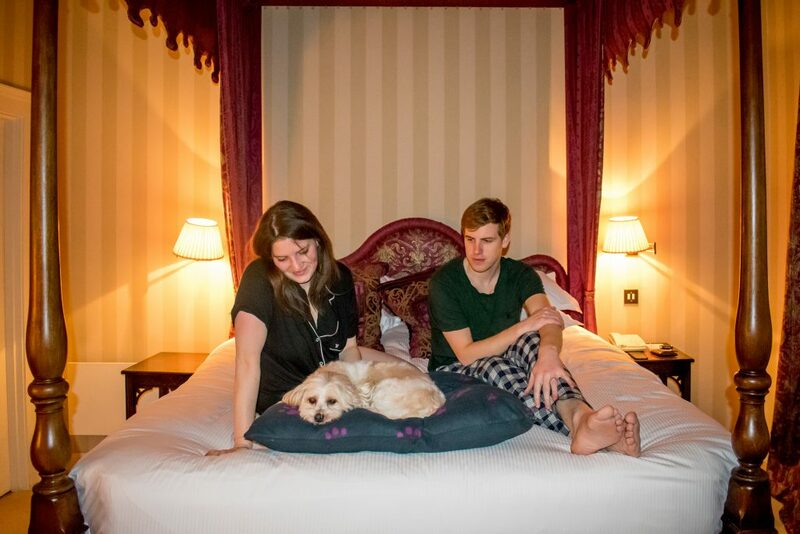 Our hotel experience in York was absolutely wonderful & felt extremely dog-friendly. 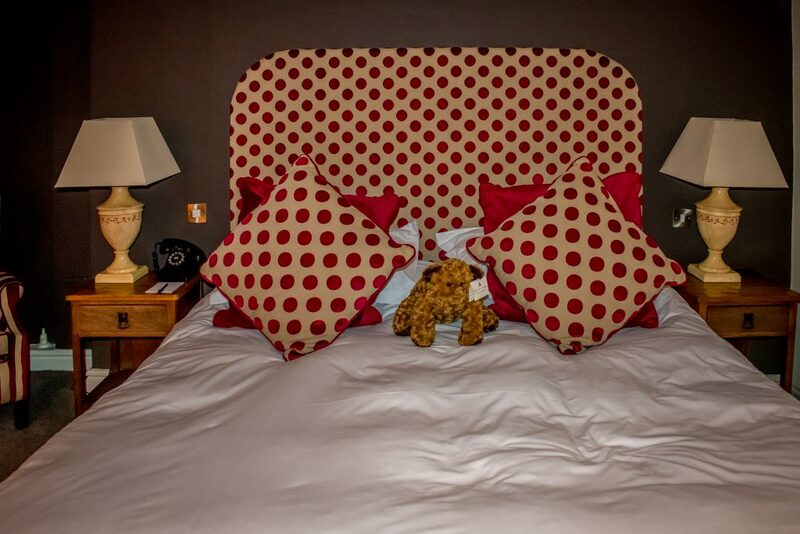 We arrived at the Grange Hotel very late on the night that we were checking in so did not have as much time to enjoy it as we would have liked, but we made sure to make the most of the time we did have. On arrival, we checked in, settled into our room, and immediately headed downstairs to enjoy a (much needed) gin & tonic in the lounge. The lounge is dog-friendly and Giorgio happily made himself at home sniffing every corner before finally settling down by our feet. In our room, Giorgio found a letter welcoming him, an extremely soft pillow bed, and an entire bag of treats! We found a MASSIVE canopy bed that we couldn’t wait to curl up in. 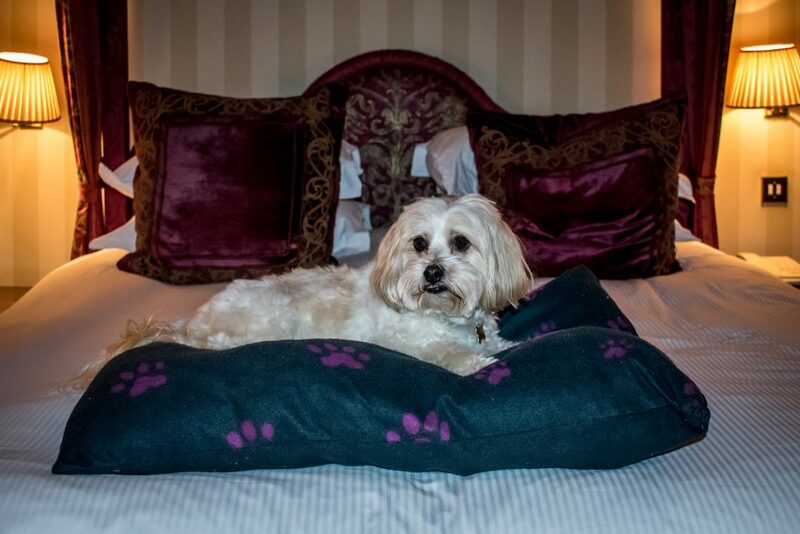 The Grange Hotel is definitely the place to stay on a dog-friendly weekend in York. Once you leave York, it seems like the opportunities for dog-friendly stays in Yorkshire are endless. That’s actually one of the things we love most about the English countryside. 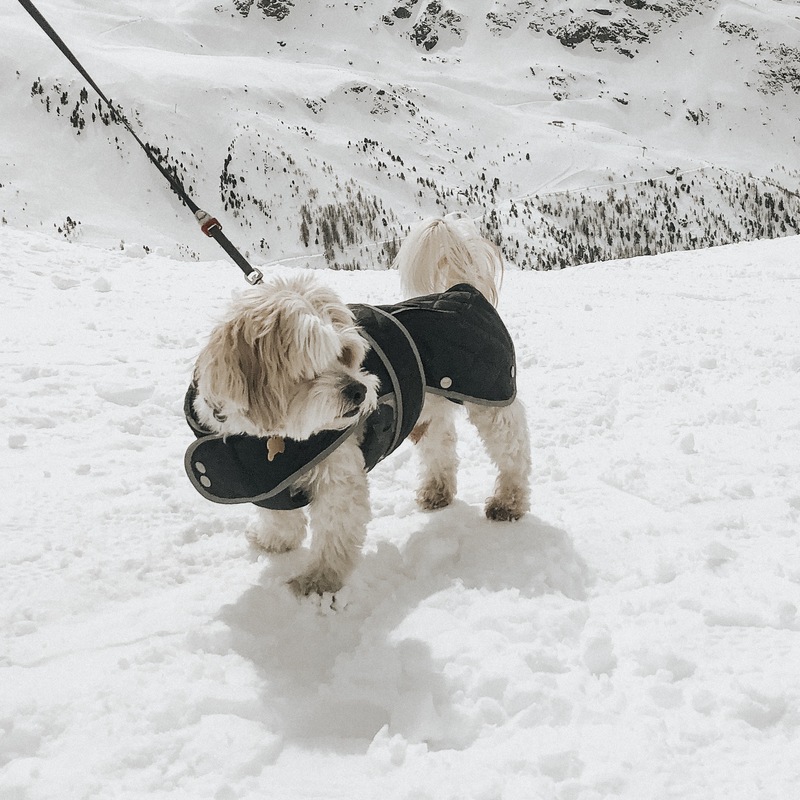 In almost every countryside location, it seems like everyone has a dog; therefore, every place is pretty dog friendly, from hotels to pubs and local shops! For this trip, we stayed at the Black Swan Hotel in Helmlsey, at the foot of the North York Moors National Park. Giorgio was welcomed with a comfy bed, a doggy blanket, two massive biscuits, and a bowl. The staff we all so friendly toward him, and Helmsley is full of dog-friendly walks, shops, and pubs. All three of us felt right and home, and immediately knew that we would be returning to the Black Swan Hotel one day. 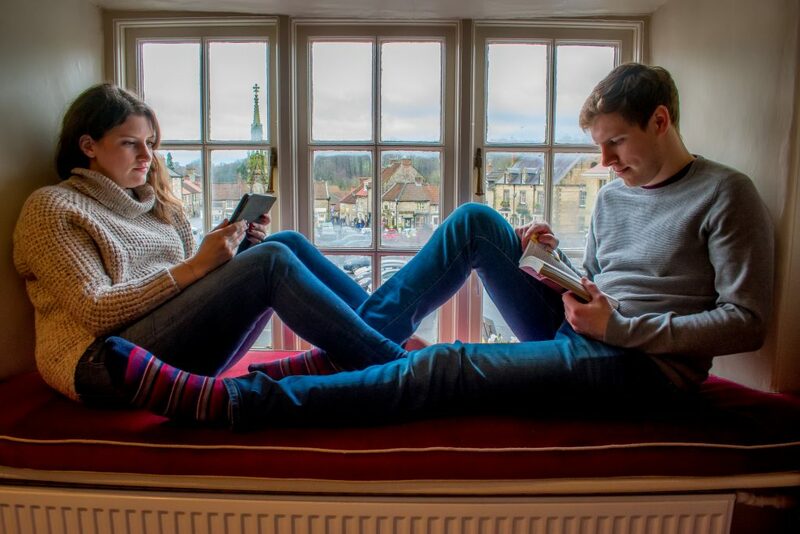 We obviously had a thing for the incredible window seat at the Black Swan Hotel – total weekend getaway goals! After our dog-friendly weekend in Isle of Wight, we have made it our mission to get Giorgio to as many of the dog-friendly English Heritage sights as possible. In Yorkshire, we were able to visit three – there were two more on our list that we didn’t quite make, but we have every intention of going back! We didn’t make it to Clifford’s Tower, but we sure did admire it from afar! 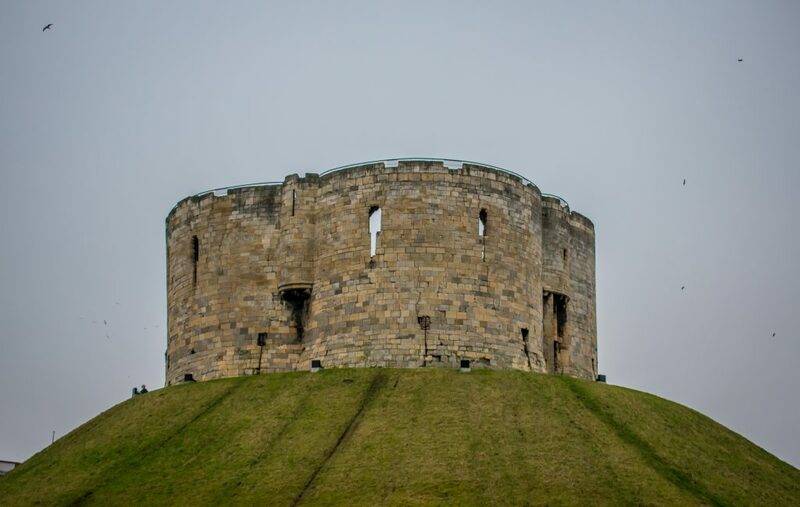 In York, we intended to visit Clifford’s Tower, but Giorgio was so tired that we chose to view it from the bottom, instead! He was much more upbeat in the country, though, so we squeezed in lots of activities during the second part of our trip. Our first stop was Helmsley Castle, not far from the Black Swan Hotel. 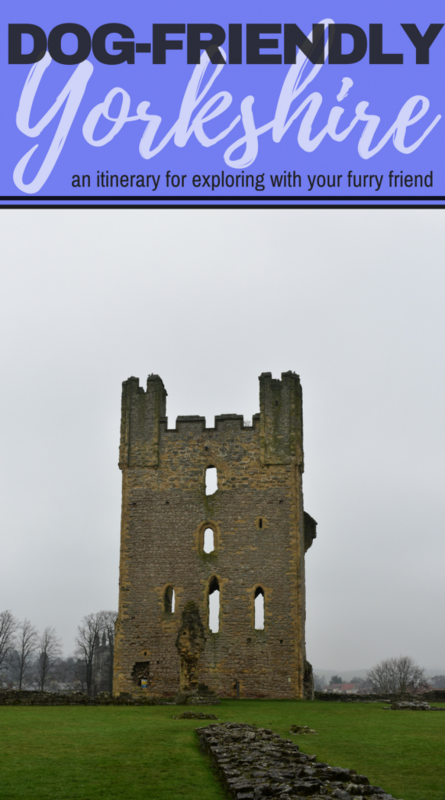 It’s truly amazing how well some castles are preserved, and dog-friendly Helmsley Castle is no exception. The weather was not on our side, but thankfully Giorgio was allowed in all areas of the Castle, including the covered sections (a rarity!). We hid out in the museum to escape the rain before exploring the outdoor areas and heading to the pub to dry off. The next day, we woke early and visited Byland Abbey, which is about 15 minutes from Helmsley. Believe me when I say that you’ll know when you arrive! The Abbey just pops out of nowhere with its incredible presence. It is crazy to imagine how massive it must’ve been in all its glory. 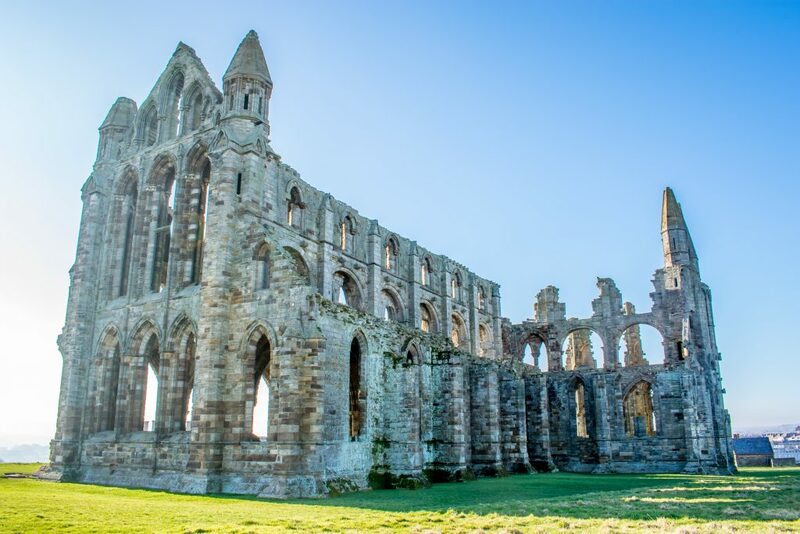 We stuck with the Abbey theme and headed out to Whitby to visit Whitby Abbey and grab lunch. Our intention was to hop on the road after that and swing by Castle Howard on our way home, but we fell so in love with Whitby that we ended up spending extra time there. While Whitby Abbey was not as impressive as Byland Abbey (to us, at least), the town of Whitby stole our hearts. We popped into the adorable Monk’s Haven Cafe for lunch – it’s dog-friendly, of course! – before wandering around for a bit. While we thought that York didn’t feel very dog-friendly, Whitby was the opposite. Seriously, as we sat there at lunch, I swear every group I saw walking by had a dog with them. There were dogs EVERYWHERE – I was in heaven! 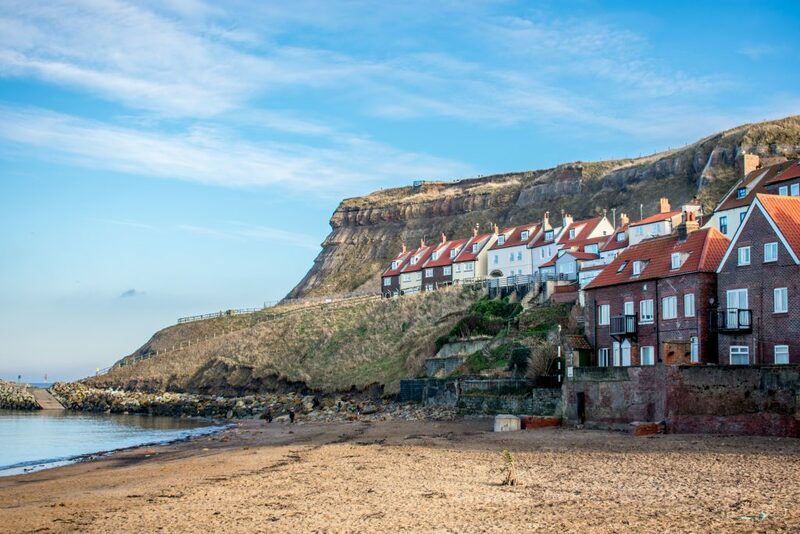 Whitby is adorable, very dog-friendly, and perfect for a day trip from York. Whether you want to wander down to the beach, walk around the harbour, or just sit in a pub, there are plenty of things to keep you occupied. As we were leaving, we realised that we didn’t even have the chance to explore half of Whitby. But we loved the half we did explore! When we weren’t out exploring the sights with Giorgio, we were either in a cafe or a pub warming up, getting dry, and resting. Our favourite cafe in Helmsley was The Cocoa Tree, mainly because they served milkshakes (Sean loves milkshakes). The cafe is run by a lovely couple who do all the cooking and milkshake making themselves. They were so welcoming I think we could have sat there all day if we didn’t have a muddy dog to wash up! We managed to hit most of the drinking spots in Helmsley, but not all of them. After all, a country getaway is not complete without spending ample time in a local pub (or two or three…). The pub at The Feathers had an open fireplace and showed the football, which made for a perfect Saturday afternoon. At the Black Swan, we had a spot that we less pub-like and more lounge-like. One room had small tables and comfy chairs, while the other had couches and chairs and a roaring fire. Helmsley is also home to Helmsley Brewing Company, which has a dog-friendly bar. We went in one night before dinner to try it out and were really impressed with the quality of the beer. There’s a great atmosphere inside the small bar and Giorgio even made a lovely Spaniel friend! We love supporting local breweries and will be keeping an eye out for Helmsley Brewing Company beers as we continue our UK travels. Giorgio Tested, A Pair of Passports Approved! We are starting to favour UK weekends over international travel more and more these days. It’s so much fun to take Giorgio along and watch him run around like he’s a puppy again. Plus, it feels like our UK travels are more relaxing and enjoyable – we can kind of take a chill pill and just go with it instead of trying to cram a ton in. The downside? Muddy paws make an all too frequent appearance! Exploring York was a lovely experience, but the countryside is where Yorkshire really shines. I think we’ll without a doubt be returning to the Black Swan at some point. 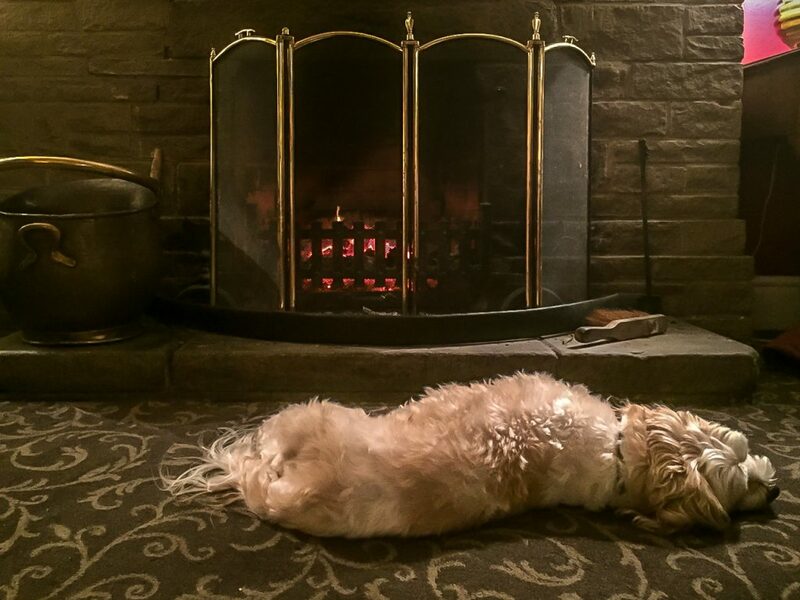 Giorgio’s favourite part by far was curling up (or spreading out) in front of the open fire at the hotel. 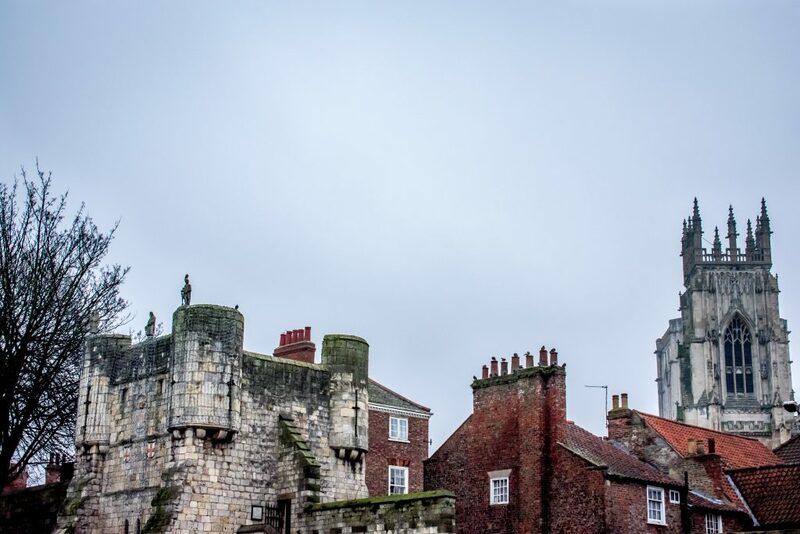 Anyone visiting the UK should make a weekend trip to York; on your trip, we highly recommend going beyond York to explore more of Yorkshire. Let us know how you get on with your trip! This post is in collaboration with Visit York. Of course, all opinions and words above are 100% our own. This trip was part of our mission to go Around the UK in 80 Weekends. Check out where else we have been here. Giorgio is so adorable! He looked like he had a wonderful time. Love the photos! 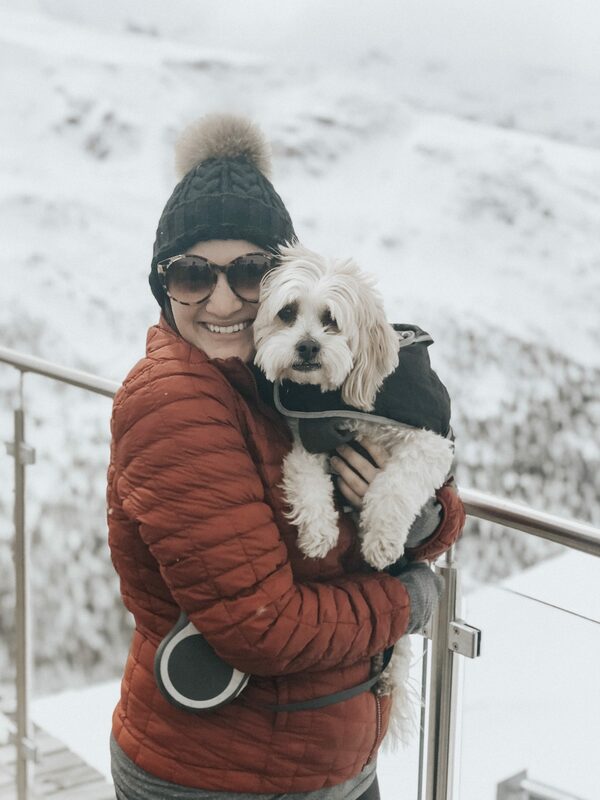 Now the question is…can I borrow your dog for a trip? How about next time you guys have a trip planned to paradise, you can come to London and hang out with Giorgio and we’ll go on the trip in your place – haha! Giorgio looks right at home! We would love to bring Ben to such a dog-friendly place. He would love laying by that fireplace as well. 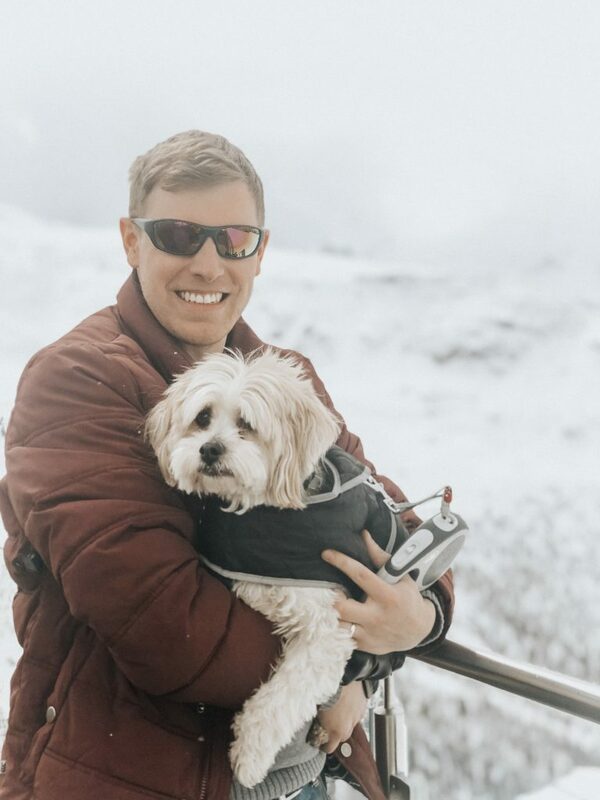 Have you guys done much dog friendly travel in the US? I’m sure there are places like this in the mountains and stuff! Love that the hotel lets doggies come! That is always so nice! It’s such a game changer! We love traveling domestically so much more now because we can bring Giorgio along! After studying abroad in Florence, Italy I noticed that places are becoming so much more dog-friendly. That’s so weird that York wasn’t too friendly. I’m glad everywhere else seemed to be much more appreciative of furry friends. Such gorgeous views, and thanks so much for letting us come along with you! Maybe because it was a gray day there weren’t dogs out and we just didn’t notice it? But compared to other dog-friendly cities we have visited, where there were dogs literally everywhere, it definitely felt different!